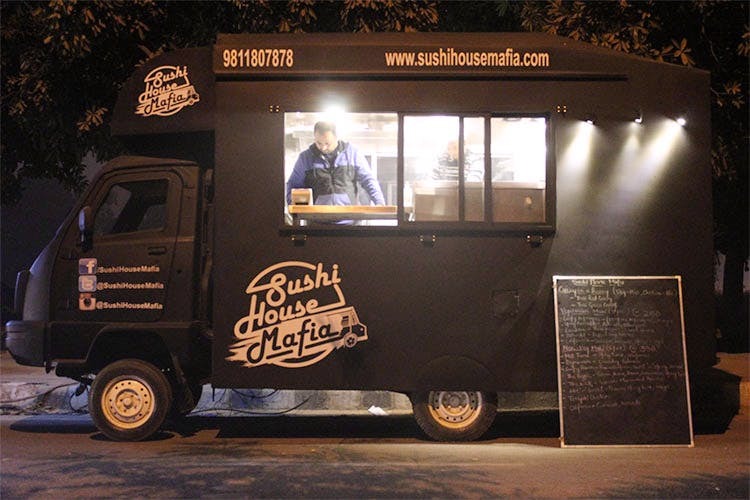 The owners of Eggjactly have opened a new food truck in Gurgaon. Sushi House Mafia offers a variety of contemporary sushi, with a twist in the flavours. Sitting beside the bright yellow colours of Eggjactly is Sushi House Mafia. The two trucks, owned by the same people, are almost amusing side-by-side. The small, slick, black truck of Sushi House is a stark contrast to the colour of Eggjactly. They look almost like two wildly different siblings forced to share a room, or in this case, a street. We check out their menu and find Maki roll options, but with a twist. The usual spicy tuna roll now has some jalapenos thrown in and is known as the Hot Tuna, the popular salmon roll is slapped together with tuna, prawn and cucumber to become the house special The Biggie, and the famous rainbow roll is given a veg twist to become a three peppers and cream cheese Rainbow roll. We ordered Crispy Asparagus and California rolls from the veg section, and The Kick and The Biggie rolls from the non-veg. The asparagus rolls did as promised and offered a delightful crunch with every bite. The California rolls were as you would expect, with the avocado adding a nice balance to the palate. The Kick, which is a wasabi marinated prawn roll wrapped in seaweed, was the standout, with a flavour unmatched by the other dishes. Last came The Biggie, a medley of tuna, salmon and prawn that really filled up the stomach and went best with the wasabi served on the side. Sushi House Mafia gave us the opportunity to eat good, fresh sushi right in our car! For that they definitely get our love. While we didn’t get the chance to try their Thai Red or Green curries, our stomachs were more than content.